Machine to Machine (M2M), Industrial Internet, Internet of Things (IoT)… different names, but they all in a way converge on the same thing, looked through different lenses. This is one of the biggest emerging trends in network computing. Mega-trends like these happen once in a decade or longer. At Sun Microsystems where I spent 10 years, we used to have a tag line from start till the end which said: The Network is the Computer. What a vision that was, and it outlasted the company! Scott McNealy and others at Sun frequently would talk about the connected refrigerator. Today, it is a reality. Smart machines are here to stay and not only stay, but to grow and thrive. A company that sells any kind of hardware (washing machines to MRI machines, cars to planes, computers to mobile devices, the list goes on to virtually every physical object sold by someone), cannot afford to sit by on the sidelines and watch this mega-trend demolish them. These companies have to react and respond, and do it now. GE, Cisco, and many other large corporations have long realized the importance of IoT. One of my favorite ads on TV (I don’t see it on anymore) comes from GE where all kinds of machines are coming home (I found this, but those videos are no longer active on youtube, however I did find this one that still works, sort of). Also check out what Dave Evans, Chief Futurist at Cisco says about this topic. The point is, we have not only been talking about IoT for a long time, in fact, it has silently become a reality. Those that are still asleep at the wheel of their organizations can now ill afford to not notice and take some action. I was talking to my friends Alok Batra and Jane Ren, who just launched their new company MQIdentity. Alok and Jane are well-known thought leaders and change leaders behind the Industrial Internet and M2M related transformations at Cisco and GE. Their knowledge of this space is quite vast and impressive. So I asked them, what is MQ? They explained it stands for Machine Quotient. They went on to describe two concepts: Machine Quotient (MQ), the technical measure of efficient machines. You want MQ to be really high. And Service Coefficient (SC), the business measure of service competency. 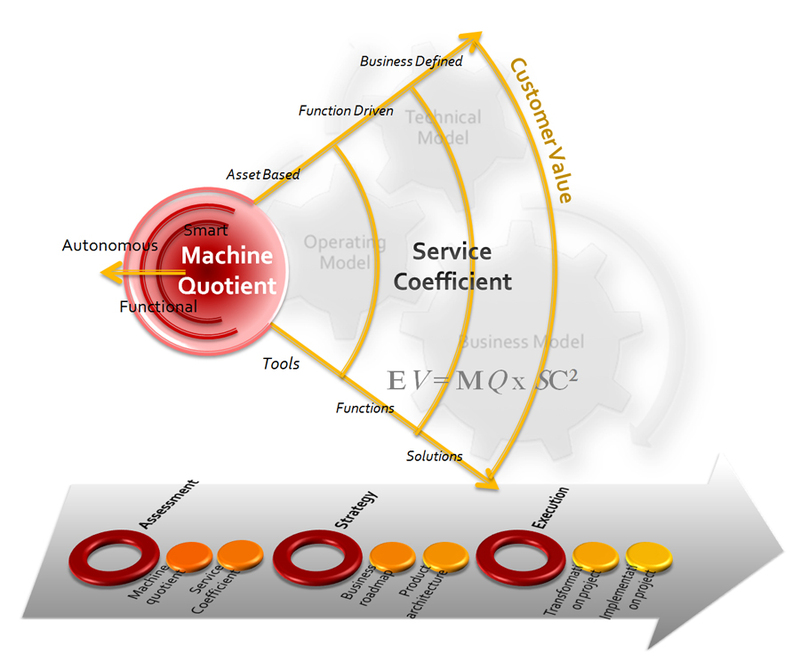 For your organization, you need to find the right combination of MQ and SC to bring the maximum effective business value out. All this sound too complex? This is where I think Alok and Jane with their MQIdentity methodology can help. TaaS gives you a new way to expand your proprietary IP and technology, by unlocking its access to new customer base leveraging other proven services model (IaaS, SaaS, etc.). Your business is heavily disrupted by technology trends and you cannot stand by any longer and watch your customer base erode to newer solutions while you still have huge value locked inside your proprietary technology/products that can generate new revenues and expand in ways that you can’t otherwise think of expanding. Your business is also disrupted by new startups who are going to offer the state-of-the-art solutions at a much lesser price, even though their solution may not be as excellent as yours, you will see customers erode to the “good-enough” solutions. In short, this is a space (M2M/IoT) that I am totally fascinated about, and this space is going through tremendous innovation. As a result, in the coming years, there will be a new emergence of creative solutions, products, business models. In my opinion, Alok and Jane are right in the thick of it. So watch this space, it will be exciting! 1 – There are many other implications, consequences and micro-disruptions at work in this area, read their white paper or their executive summary for more details. Don’t just take my word for it.